Since she was a little girl, Liv had had a penchant for all things sweet, but it wasn't until I caught her in the pantry with her fingers in my sugar jar that I understood just how much. How many people do you know who when asked the question "What is your favorite food?" answer, "Sugar!" We have a constant battle to put healthy foods into her growing, dancers body and usually make some sort of healthy compromises. Things like whole grain pancakes for breakfast with extra syrup, a banana for a snack followed by a small sweet treat, finish your vegetables for dinner dinner before that much anticipated dessert, etc. Strawberry Crepes for breakfast was no different. While perusing other cooking blogs (which my husband is saying I'm doing way too much of lately!) I discovered this sweet, strawberry recipe. The crepes were a special birthday breakfast for the author of For the Love of Cooking's son and seemed to be met with equal enthusiasm. Knowing my Olivia's love for strawberries and sweetness, these looked to be something she would love, and we were definitely not disappointed! This was my first attempt at making crepes, and amazingly, they were far easier than I had imagined! The batter whips up quickly and easily, and once I realized that less is better when cooking the delicate wrappers, we were in business. They cook up in just a minute or two and with a quick flip to completely cook the other side you will quickly be ready for the slightly sweetened strawberry filling. Our compromise on this dish was the filling... the recipe called for sweetened strawberries, but knowing that Liv would enjoy dusting (showering?) her crepes with powdered sugar we opted for plain strawberries, no sweetener. The whole family enjoyed the breakfast treat but my husband said he was left wanting some sort of sauce on top. For an adult version, our Grand Marnier Vanilla Strawberry Sauce would most definitely add a scrumptious topping to these delightful treats. Combine the diced strawberries and the sugar if using. Combine the first seven ingredients in a large bowl (eggs through salt) whisk thoroughly to mix, making sure there are no lumps in the batter. Heat a small non stick skillet over medium heat and spray with cooking spray. Using a small ladle, pour 3-4 tablespoons of the batter into the hot pan. Tilt the pan so that the batter spreads evenly over the bottom. Cook for 30 seconds to 1 minute per side, then carefully flip the crepe and cook for another 30 seconds to one minute. Remove the cooked crepe and place on plate. Spoon 3 Tablespoons of the strawberry mixture down the center of the crepe and roll. Dust with sugar or alternatively spoon sauce over the crepe and serve! These will be best served directly after rolling. these look absolutely wonderful! 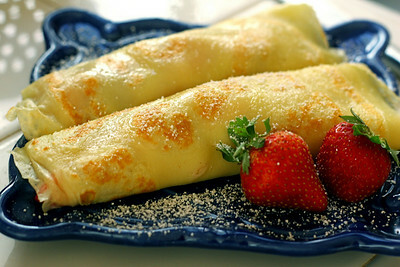 I love strawberries and these crepes look divine! What a delectable treat! Scrumptious for breakfast or dessert! Thanks to both of you! Tomorrow is my daughter's 11th birthday, and I have been requested to stop at the Farmer's Market today for lots, and lots, and lots of strawberries so we can make these for breakfast. Wow, this sounds amazing and your photos here on your blog are stunning! I can't wait to check out more of your posts. Bridgett... I'm so glad you liked these! They are up again on the menu tomorrow morning for a special birthday breakfast! I have also filled these with a sweet cream filling. But seeing as you have a child with a sweet tooth, that may not be worth figuring out. My child has been punished for eating out of the sugar jar also.